You can analyze literary texts in different ways, and one of them is to use a number of elements of literature and literary devices which can make any essay shine. Through them, it is much easier to give explanations of the key points. We will tell about the most significant elements out of a great scope that the writers can use with benefits. Those are the primary story undertones; however, in contemporary fiction, there are also additional insights related to feelings, behavior, or current events, which cause internal debates among the readers. Being the action of the story, this device on the literary elements list is challenging for discussion. Many students start the discussion of what events actually take place in the story and present not a required analysis, but a summary. Note an important rule: discussion of the things the readers already know from the reading the story itself makes no sense. Instead, focus on the unique features of the plot or on way the plot supports the key point of your analysis. If the climax of the story lacks falling action, mention that for sure to emphasize the emotional effect. If the story has a non-linear storyline with jumps forward and flashbacks, let the readers know about that. At the same time, merely the events of the story do not deserve to be included in the analysis. When we define elements, we pay attention to characters as they enable us to make literary analysis much stronger. Again, one of the most serious traps for inexperienced students is writing a summary instead of analysis. Never make a focus on the characters’ actions; instead, analyze them at a more profound level. What do the characters represent? Who are they? Protagonist is a ‘good one’, a ‘hero’, a leading character, although he often does nothing heroic in the story. Simply stated, he is the main character of the story. Antagonist is a ‘bad one’, a ‘villain’, the opponent of the protagonist; although it may appear that he is not that villainous in the story. Catalyst plays an essential role in the story action, although he or she does not belong to either antagonists or protagonists. A literary elements definition mentions that the roles of the characters are frequently interrelated. The foil concept is the one used in literary analysis for a more profound study. A narrator is always present in the work of fiction even if the readers do not realize that. Narrator makes a story as it is, actually, the flow of words. It can be presented from a number of various perspectives, and the story point of view can be defined as a perspective for giving a narrative is given. Third person limited: According to the writing elements meaning, the story with a third-person limited point of view has only one character followed in the narrative at a time. The readers can judge what is happening from a character-centered perspective, but the story is presented by an invisible unseen narrator, not the character. There are no personal pronouns ‘we’ or ‘I’. Thus, the readers know about the emotions and thoughts of a single character, being totally unaware about the emotions of the other characters of the story. Even if such focal characters change, there is always only one of them at a time throughout the story. Third person omniscient: In this case, a third-person omniscient narrator takes a perspective of a god. The elements of a story are presented in the narrative told from a perspective without any connection to the characters; however, he can clearly see what is happening. Thus, the readers know about the emotions and thoughts of all characters, not only the focal one. It is a common point of view in the fiction at the end of the 1800s and the beginning of the 1900s; however, it is also gaining more popularity now in contemporary literature. Third person objective: The perspective of this literary structure is absolutely different from the third-person omniscient one. The readers have no access to the emotions or thought of any of the characters. They can see only the characters’ actions and perceive the story as a report. According to the literary concepts, such a narrative is similar to reporting news. According to the theme definition, it is presenting the subject of a piece of writing; however, it can be done through the use of various effective devices and elements. When we define theme in literature, we tell about the idea that pervades a certain work of literature. As for the popular plot devices, one of the most in-demand ones is irony. It can be explained as something contrary to expectation. Most often, irony is used as the main element of the short story that draws the readers’ attention. Thus, it deserves being a subject of an effective literary analysis. It is applied in a number of various ways to appear at multiple levels of a story. It does not relate to poem themes, but in a short story, irony may be either exercised throughout or be found in numerous examples here and there. Situational: One of the most popular types of irony, it can be seen in literature with a striking difference between the events and the expectations regarding the story. Dramatic: This type of irony demonstrates disconnection between the knowledge of the character and the audience. Most frequently, the audience is aware of what the character has no idea. After you have asked a question, “What does theme mean?”, it is time to focus on the tone of the story. The latter is made on the basis of the narrative attitudes with the support from the actions and words of the characters. This is the voice of the story with its peculiar style used to add impressive effect and inspire empathy of the readers to the characters. All common literary themes imply having a setting of a certain kind. It is the stage for actions. When the students define the story setting, they refer to the time and place of the story events. It is useful for the students to have a look at the list of common literary devices when they start working on their essays of literary analysis. This assignment motivates them to note why and how a literature piece was written. Successful analysis of a poem, novel, short story, or play requires the knowledge of why the authors have made their particular choices. Your task will be to explain the reasons and significance of the made choices and tell which element of plot is important for understanding the theme of a story. You can also work on literary analysis, taking into account your own perspective of the story. Consider not the intentions of the author, but about which genre uses narrative and poetic techniques to tell a story and develop your own arguments. Take the original literature piece for analysis, have a look at the terms presented below and tell which of the following represent elements of an author’s style. Allegory is a form of narratives with the characters representing generalized humanistic features, in particular courage, vanity, or any other. It is aimed at conveying a valuable lesson to the readers. Unlike other types of literary devices, allegory used to be based on characters, but now there is a tendency to make the story parallel. Character is a presentation of things, places, and people in a work of fiction to show common human functions and activities. 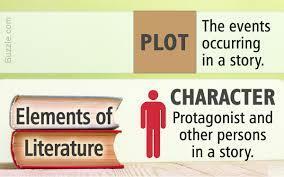 Protagonist is the main character in the center of the story. Antagonist is an opposing force. Minor character is used for the greater focus on the protagonist and supporting him throughout the story. Static character is never changed throughout the story. Dynamic character is a hero that undergoes transformations. Characterization is one of the lit devices which reveal the actions, appearance, and motivations of a character according to the author’s choices. Denotation is a word meaning. Diction or particular choice of words is used to emphasize the theme and meaning of the poem via different rhythm, sound, letters, look, patterns of syllables, etc. Figurative language belongs to all basic literary devices to express the meaning hidden somewhere beyond the word literal meaning. Metaphor is a contrast used to ensure the enhancement of the meaning in a certain theme or situation with no ‘as’ or ‘like’. Simile is a contrast used to ensure the enhancement of the meaning in a certain theme or situation with ‘as’ and ‘like’. Hyperbole is mostly defined as exaggeration. Personification is providing human characteristics to non-human objects. Foot is making groups of syllables (stressed and unstressed) in a poem or line. What are literary devices related to stress in the syllables? Iamb is an unstressed syllable before the stressed one. Spondee is a pattern “stressed - stressed”. Trochee is a pattern “stressed - unstressed”. Anapest is a pattern “unstressed - unstressed –stressed”. Dactyls is a pattern “stressed - unstressed – unstressed”. Imagery is the attempt of the author to produce a reference point for the readers. You decide which statement best describes the main idea, but the most effective imagery forms are visual as they cause response of sensational, emotional, or even physical type. Meter is the rhythm structure in a poem. Resolution is the ending of conflict in a certain way. Plot is the way the ideas are arranged in a story. Foreshadowing of implied or explicit forms is giving a hint to the reader about something that may happen. Suspense is the created tension for the readers’ feeling of discomfort as they ar unaware of what will happen. Conflict is the struggle between the opponents. Exposition is a combination of background details (plot, setting, characters). Rising action is building the key conflict via the story process. Symbolism is representation of an idea by an object. Crisis is a serious turning point which defines the ending.